TNPSC has published the notification for the Assistant Statistical Investigator 2015 with 270 Vacancies. 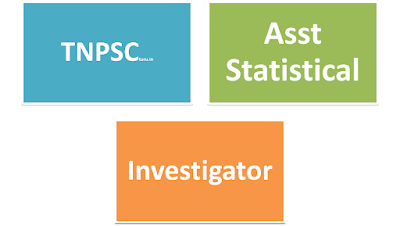 This Page dedicated for discussing all the latest news regarding TNPSC Assistant Statistical Investigator Exam 2015. The important details are as follows. 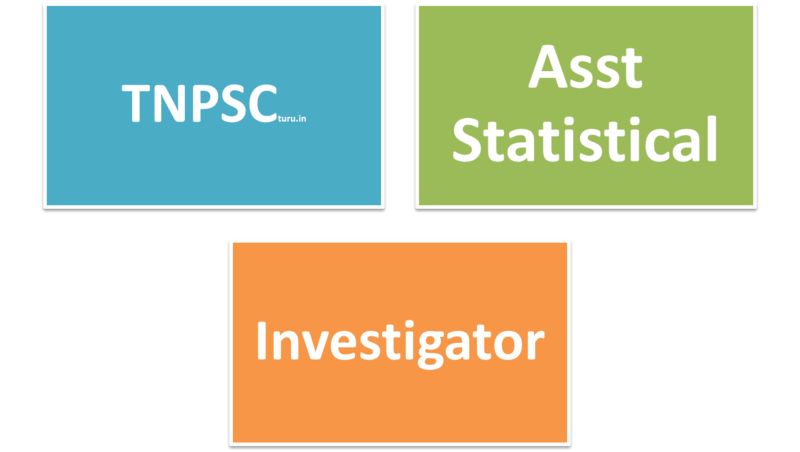 The eligible candidates can apply online for the Assistant Statistical Investigator 2015. The official notification for the post of Assistant Statistical Investigator 2015 was published on 7th May 2015. You can download the TNPSC Assistant Statistical Investigator SI 2015 Notification, Syllabus here. Assistant Statistical Investigator 2015 (Post Code: 1824) and 270 Vacancies. Paper 1 (Statistics) - 11.7.2015 - FN 10.00 A.M. to 01.00 P.M.
Any Degree with Post Graduate Degree in Operations Research/ Econometrics / Mathematical Economics. The TNPSC Statistical Inspector 2015 Question Papers with answer key download link will be updated here very soon after the exam. TNPSC SI Assistant Statistical Investigator 2015 exam result is expected to be published within 2-3 months. The Result link will be updated here after the publication of the result. another one doubt sir..TNPSC wrong key ah change panni ,ellarkum mark poduvagala.. ila representation sent pannavagaluku matum mark poduvagala sir?? Becz nan 2 qus ku represenrtation anupala anish sir..
plsssssss give ur answer sir..
Sir, I have attend tnpsc - high court - typist - Certificate Verification on 07.04.2015. when will call for Counselling scedule?. would do you know please reply me? Thanks. What is syllabus of tnpsc statistical investigator exam ? How to prepare for tnpsc statistical investigator exam book without syllabus? hi anish sir, is BE ECE student eligible for this post ??? Yes you are eligible for tnpsc statistical investigator exam book online? hai sir, my grp4 mark is 232.5 any chance? My mark is 250/500 ... Female .... MBC Quota... is there any possible to get job in Assistant Statistical Investigator. Is there any possible to select for this job? Reply me.... Iam waiting for final result. When will call assistant statistical investigator counselling 2016..